Apple began an all-out attack on home audio last year, announcing the HomePod smart speaker at its 2017 Worldwide Developer Conference. And now, after much anticipation and delay, the HomePod has arrived: Pre-orders began online January 26, in the U.S., U.K., and Australia (Germany and France will have to wait until later in the spring), and the HomePod arrived in stores Friday, February 9. Digital Trends finally got a review sample, and our Apple HomePod review is in. The speaker sounds amazing — but Siri still has room to grow. Not that Apple would acknowledge that, of course. “HomePod is a magical new music experience from Apple. It brings advanced audio technologies like beam-forming tweeters, a high-excursion woofer and automatic spatial awareness, together with the entire Apple Music catalog and the latest Siri intelligence, in a simple, beautiful design that is so much fun to use,” said Philip Schiller, Apple’s senior vice president of worldwide marketing. Per a report from the Taipei Times, one of the HomePod suppliers, Inventec, has already made 1 million units of the smart speaker. Together with Foxconn (the other maker), the two companies expect that between 10 and 12 million units could be shipped by the end of 2018. The HomePod takes aim at new smart speakers that have been dominating the market in recent years, including devices like Amazon’s Alexa and Google’s Home, while simultaneously looking to capture the high-end (and home-filling) sound of Sonos’ multiroom speakers. The speaker’s design doesn’t deviate much from the smart-speaker playbook, looking very similar to multiple wireless speakers on the market as of late. The speaker stands just under 7 inches tall and is covered in acoustically treated mesh. Inside is a 360-degree array of seven tweeters along the base and a 4-inch, upward-facing woofer claimed to combine for excellent, room-filling sound. In addition, onboard processing via Apple’s A8 chip means that the speaker offers spatial awareness to automatically tune itself to any room. Multiple speakers can also be synced together, including pairing two of the speakers in stereo, a la Sonos’ Play:1 speakers, among many others. And of course, we can’t forget the smart functionality via Apple’s sassy assistant, Siri. With an array of microphones inside and Siri on board, the HomePod will integrate seamlessly with the company’s Apple Music streaming service, allowing users to ask questions like, “What was the top song in 2015?” or more ambiguous requests like “Play something new.” Thanks to cloud connection, users can also ask the HomePod the same questions they might ask an Echo or Google Home device via Apple’s Homekit protocol, ranging from simple requests like reminders to complex smart home controls, whether you’re in your home or abroad. You use the wake phrase “Hey, Siri” to start sending your information to the cloud via an anonymous Siri ID, and your voice is picked up with six microphones, even when your playlist is on. Thanks to encryption and anonymization, your questions and commands won’t be linked to your Apple ID. Google Home and Amazon’s Alexa make you delete your history manually if you’re uncomfortable having everything tied to your account. Naturally, the speaker works with HomeKit, so it can control compatible smart home devices. If you have scenes set up, you can tell the speaker to turn on Going to Sleep mode or Movie Night. Since the HomePod acts as a hub, you’ll also be able to control your devices remotely, something you previously needed an Apple TV to do. What if your smart-home device isn’t HomeKit compatible? You might be out of luck. 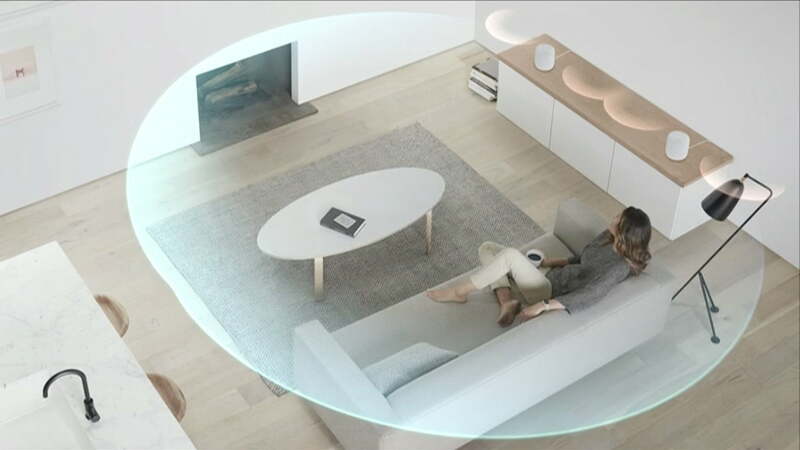 Unlike its typical closed-ecosystem approach, Apple is also casting a wide net for its new multiroom listening system, coming with Airplay’s second generation. In addition to the HomePod, the company announced the new “Airplay 2” protocol at the Worldwide Developers Conference, which will integrate with iOS 11 to allow listeners to select a variety of Airplay-supported speakers to play back music in their home at any given time, both manually, and via Siri. The Airplay 2 functionality will also support third-party applications. Like Google’s Cast, the new multiroom audio functionality will integrate with Apple TV as well, allowing those who own Apple’s video streaming box to control playback on their larger screens. As far as third-party speakers are concerned, the company has announced an expansive list of high-end audio partners whose devices will be supported, including acclaimed manufacturers like Bang & Olufsen, Bose, Denon, McIntosh, Bowers & Wilkins, Polk, and even the ultra-pricey Devialet brand. This new, inclusive approach represents a significant difference between Apple’s new multiroom functionality and that of industry-leading multiroom speaker maker Sonos, which takes a top-down approach to its speaker systems, requiring listeners to buy Sonos-branded speakers to create their full-home speaker setup. Update: We spent time with the HomePod on January 25; HomePod pre-orders will begin on January 26, and will hit stores February 9.